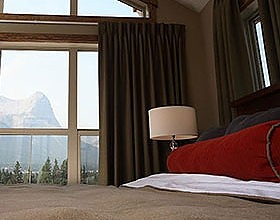 Fire Mountain Lodge in Canmore, Alberta brings the style and luxury of one of the finest urban resorts into the four-season natural wonderland of the spectacular Canadian Rockies. Fire Mountain Lodge is where Aspen meets New York. Indulge in stunning views of the Three Sisters mountains, and enjoy the abundant activities in the area. Challenge yourself with championship golf, world-class skiing, hiking, mountain biking, Banff National Park, great restaurants and Canmore’s vibrant culture. 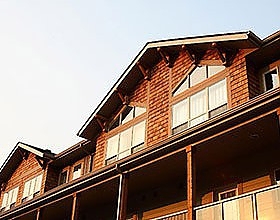 Each two-story designer condominium suite at Fire Mountain Lodge becomes a private and intimate retreat from your daily life. Enjoy granite breakfast bars with leather stools, cozy fireplaces and majestic mountain views. Warm up in the outdoor hot tub and enjoy a gourmet BBQ on your balcony with friends after a day on the slopes. For your comfort and convenience suites at Fire Mountain Lodge are also equipped with in-suite laundry, equipment storage, comfortable bedrooms, spacious living spaces, and everything you need to keep yourself entertained.